Boquete proudly inaugurated the new $1.5 million Market on January 15, 2016. President Varela, the Ambassador of the Republic of Taiwan, Boquete Mayor Emigdio Vásquez and many other luminaries attended the celebration. The President cited the market as a great example of cooperation between the federal and local governments across party lines and with transparency. Taiwan also contributed funds toward the construction. At the event, the President mentioned the new decentralization law that will distribute an additional $200 million per year to local municipalities. While a small amount relative to the central government’s budget, the redistribution will provide meaningful new financial power and resources to mayors of small towns like Boquete. The new market is an impressive addition to Boquete’s downtown and is conveniently located right next to Central Park. The Central Park received its major upgrade a few years ago and now provides a beautiful centerpiece for Boquete. Expect to see more major upgrades to Boquete and its infrastructure. The downtown is under steady transformation. In the meantime, there is limited space. We are already seeing larger infrastructure projects such as a new health center, municipal buildings, shopping centers, markets and residential developments expanding into Alto Boquete near the entrance to the valley. Expect this trend to continue. You will see buildings sprout up steadily along the road to Boquete where there is room to grow. “Varela said that with more than 200 million balboas a year that will be transferred on to the mayors of the country through the Decentralization Law can be built all markets that are needed. 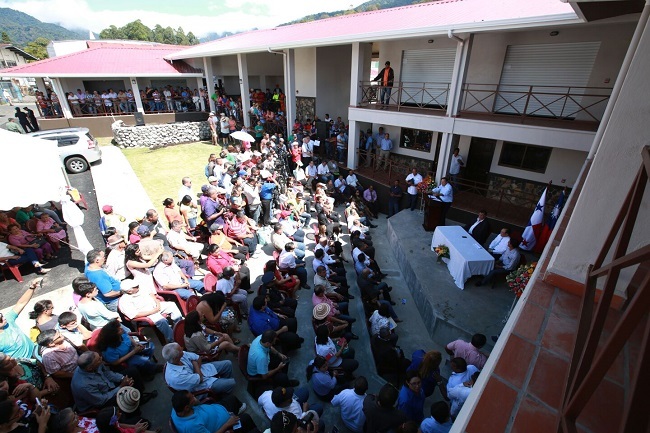 As part of the opening of the New Public, Tourism and Handicraft Market of Boquete, province of Chiriquí President Juan Carlos Varela called for replicating this management model where the producer approaches the consumer, passing on the lowering of the cost of food to the Panamanian people. Varela said that with more than 200 million balboas a year that will be transferred on to the mayors of the country through the Decentralization Law can be built all markets that are needed. “I call all the mayors of the country that they visit Boquete and see the example of working together between the municipal authorities and the central Government setting aside political differences to serve with honesty and transparency”, said Varela. The president also announced that all fairs in the country through the Institute of Agricultural Marketing (IMA) will sell bags of 25-pound of rice at 5 balboas. “This was achieved without the State losing , only transferring the benefit of repossessed price. Before the State lost 14 balboas per quintal of rice that was sold, now the State does not lose, bought with transparency,”, said the head of State. The president said that through this initiative an important movement is generated and therefore pressure is given to the large commercial platforms so that speculation will not happen again on food prices. During the opening act of the new market which had the participation of the Ambassador of the Republic of Taiwan, China José María Liu, the major of Boquete Emigdio Vásquez and authorities of the province of Chiriquí, he said he was pleased that his administration supported the opening with an investment of 675 thousand balboas in furnishings. This new market has two floors, parking, 72 vending stalls, restaurants, café, handicrafts sector and boardroom. The construction of this market after then Mayor of Boquete Manolo Ruiz made the request for the resources to the Embassy of China – Taiwan on 14, May 2013. The cost of this construction work which was completed in September was 1.5 million balboas. The President expressed that this work was necessary because the Municipal Market required a complete restructuring; it was over 60 years after it was built and had already exceeded its capabilities.